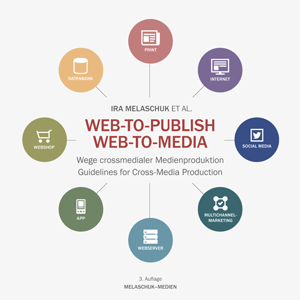 This book provides a comprehensive overview of cross-media production methods from a technical and applications-oriented perspective, focussing on web-based solutions. It provides companies looking to design or optimise media production processes with a basis for their own positioning, and enables them to plan and gradually implement entire cross-media projects. The target groups for this book include companies across all sectors, e.g. industrial and ­commercial enterprises, agencies, publishers, media service providers and printers, as well as the public sector. Possible uses for web-based media production solutions in the fields of marketing, sales, product communications, e-commerce and ­publishing are equally diverse. While corporate objectives, such as the use of digital sales channels, are a prerequisite for selecting the right technological solution, aspects for corporate strategy design can also be derived from the technological opportunities. This book conveys basic principles and practical know-how for the two cornerstones of successful cross-media project implementation: strategic alignment and technical realisation.